People have been asking about this already, and, as promised, here it is: the Lisbon Cake Post. 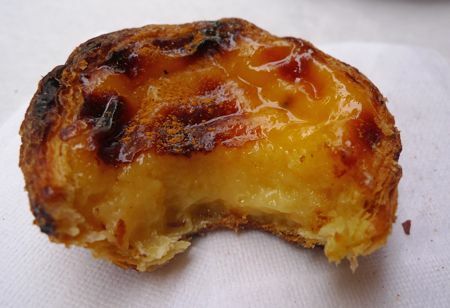 Before I launch into it, I’ll let you in on a dark and dirty secret: The famous Portuguese custard tarts (pastéis de nata) – I’ve never been a fan. Shocking, I know! I tried them a few times while I lived in London, and found them a bit insipid – quite cartony on the outside, and the flavour of the filling was just too eggy for me. But now I’m a convert. The authentic article, fresh from the oven, is nothing short of orgasmic. The queue might look formidable, but that’s for the take-away counter. The bakery’s café is surprisingly spacious, harbouring a warren of dining rooms, and finding a table did not prove to be a problem. There’s even an observation window! I’ll have six trays, please! 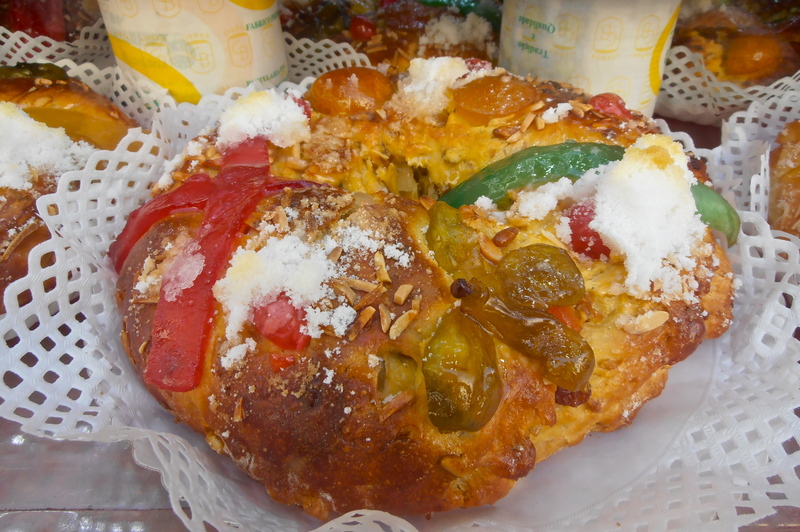 It’s called “Bolo Rei”, which means king cake. I don’t remember its name, and it doesn’t look like much, but it’s delicious. 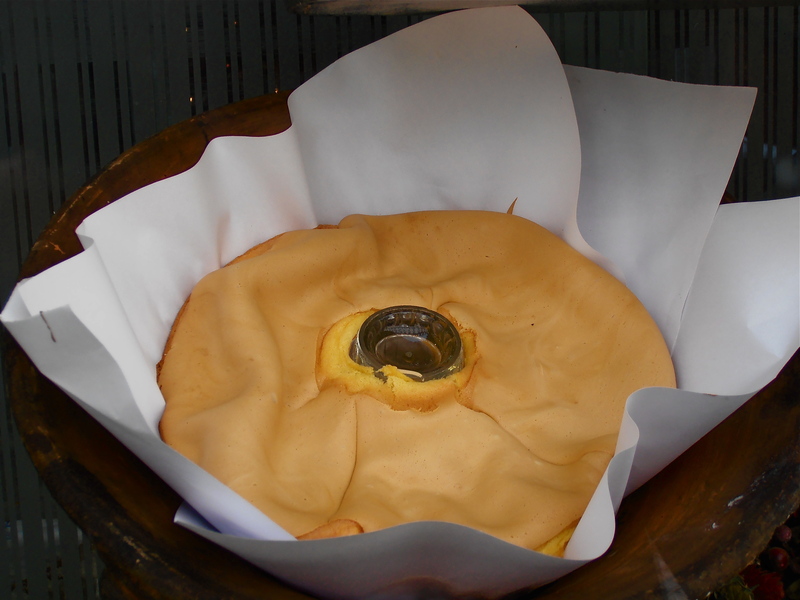 It’s the lightest, airiest sponge cake imaginable, with a very moist, almost runny centre. I’ve no idea how this is even achieved, but it totally works. 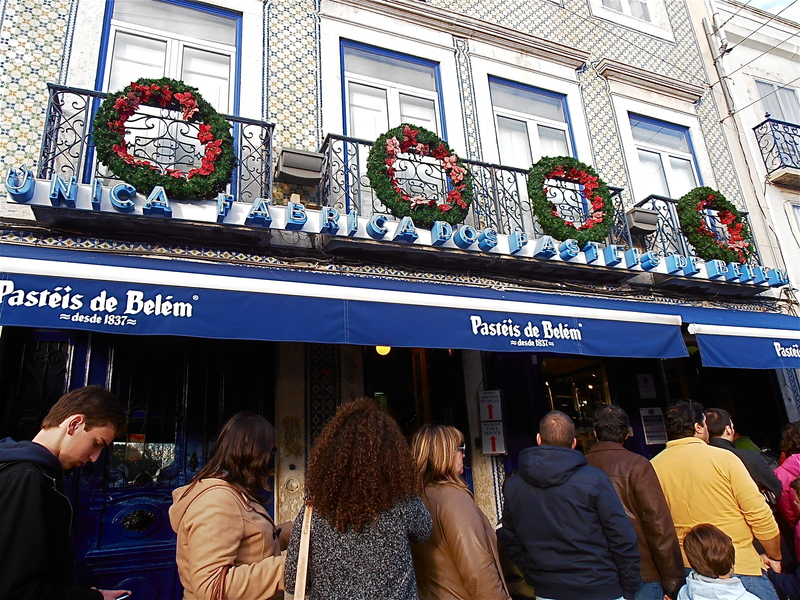 As you can imagine, I scoffed all sorts of cakeage during my one week in Lisbon, including a gloriously fluffy creation called “bolo de deus” (cake of God), which came in the form of a bun. 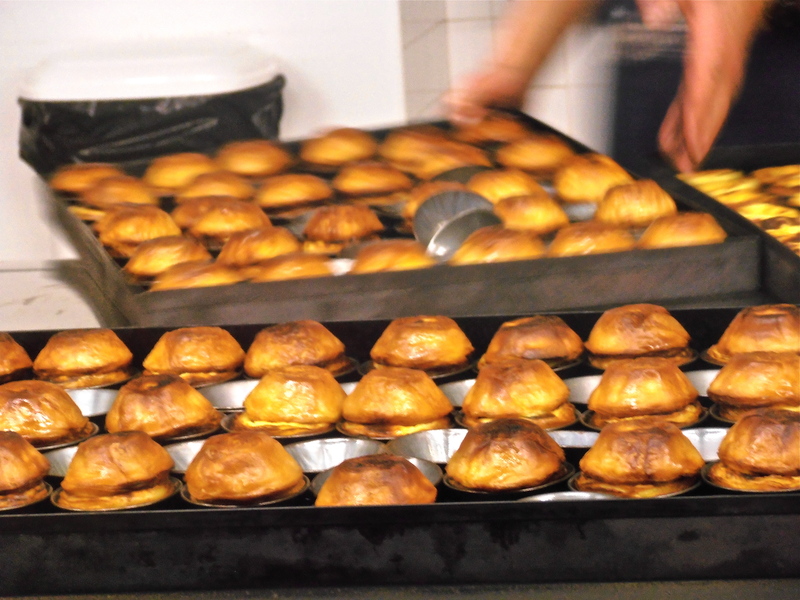 Now, if I were God and had to entrust my buns to anyone, it would definitely be the Portuguese! This entry was posted in Lisboa and tagged Cafés, Cake, Food culture, Lisbon on December 30, 2013 by ladyofthecakes. After an entire week of stuffing myself with glorious Portuguese food, my first outing less than 16 hours after arriving back home involved… food. And lots of it. 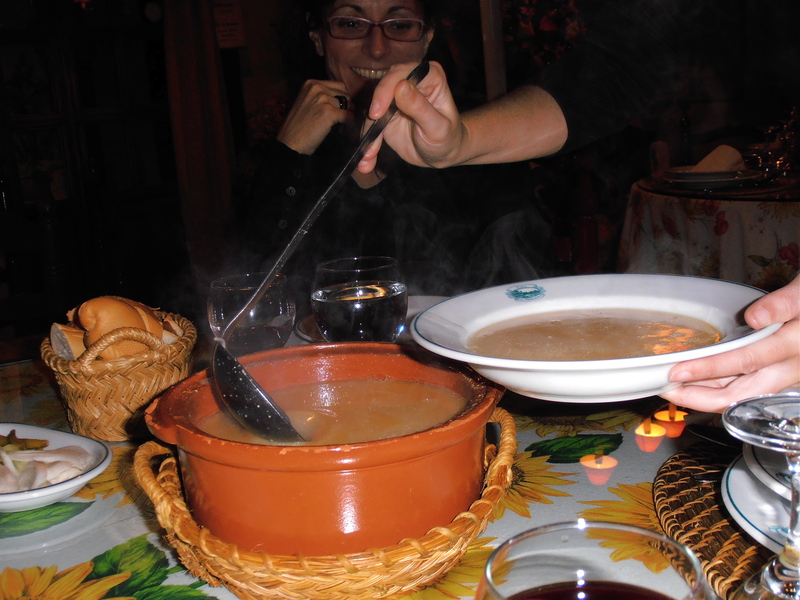 ‘Team Tapas’ was on its annual mission to indulge in the best cocido to be had anywhere in the province, served by a restaurant called Finca Los Valdespinos in the village of Carmarenilla, 25 mins drive from Toledo. 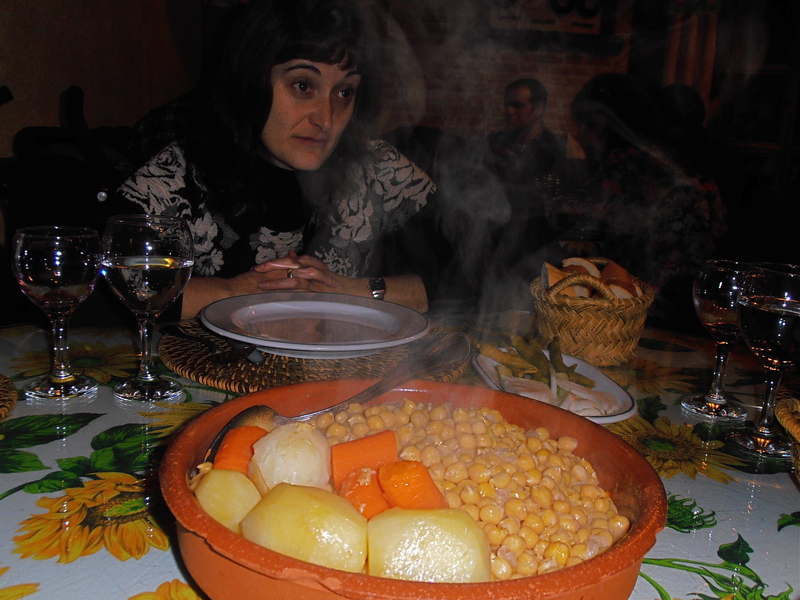 Cocido is a typical dish of central Spain (of Madrid, in particular, and often referred to as “cocido madrileño”), and a very simple affair. It’s a stew made with chickpeas (garbanzo beans to readers from the US), noodles, vegetables, potatoes and different kinds of meats. Carmen shows off her expert ladling technique. That’s Ana in the back there, drafted in by Team Tapas as reinforcement. There’s also a tomato-cumin sauce to go with the chickpeas, plus some cabbage, onions and pickled green chillies to be tossed in, according to taste. 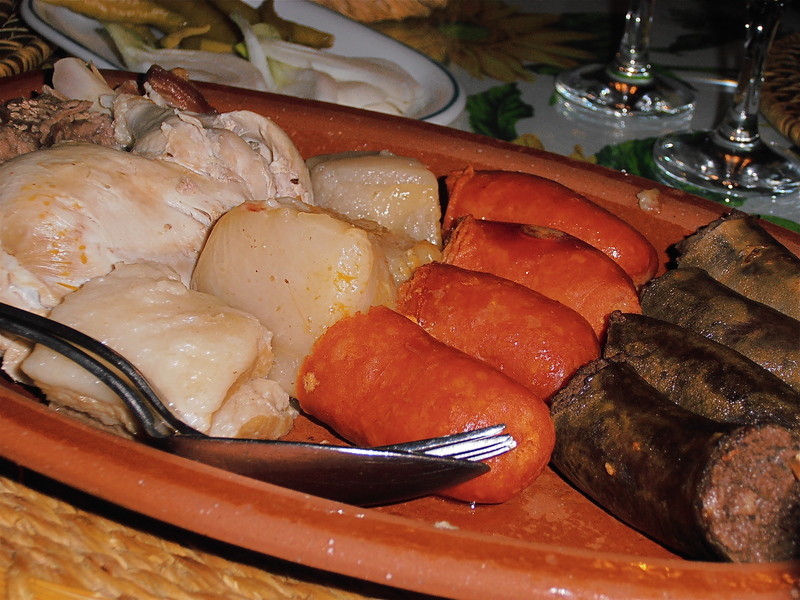 From left to right: Beef, chicken, tocino (pork belly), chorizo, morcilla (blood sausage). 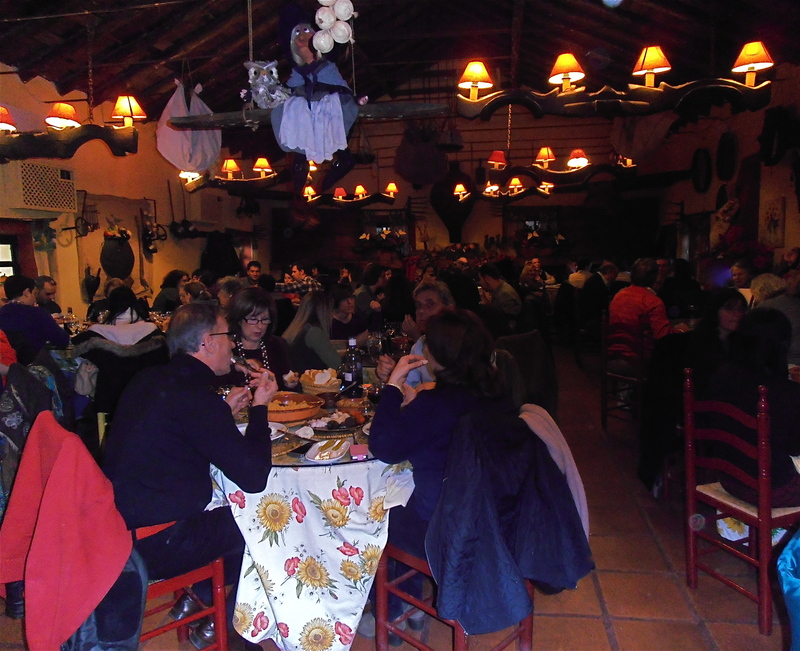 The restaurant was heaving, and they have several dining rooms. 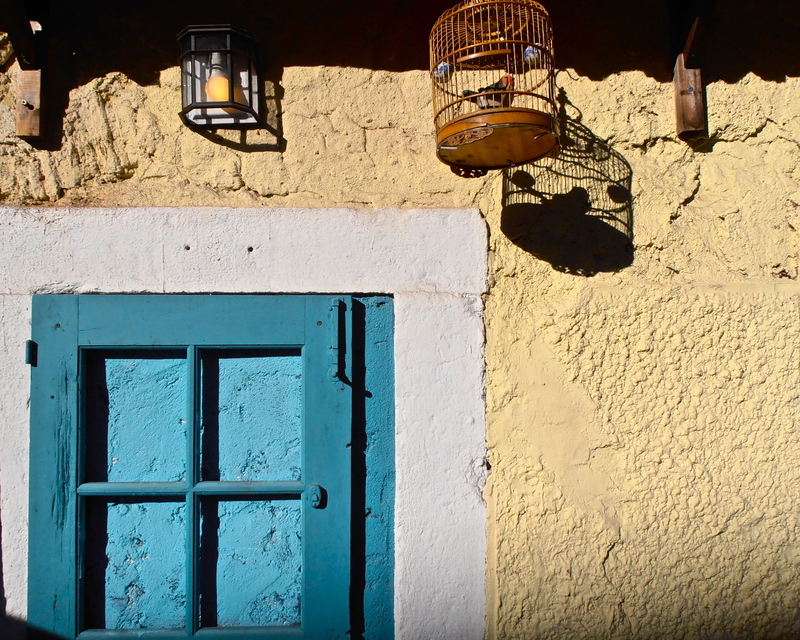 The decor of the place is … eccentric, to say the least. The rafter-riding witch you can see up there is not alone. She has an army of sisters, accompanied by straw chickens and all manner of rural paraphernalia cluttering up every available corner. It’s quite overwhelming. 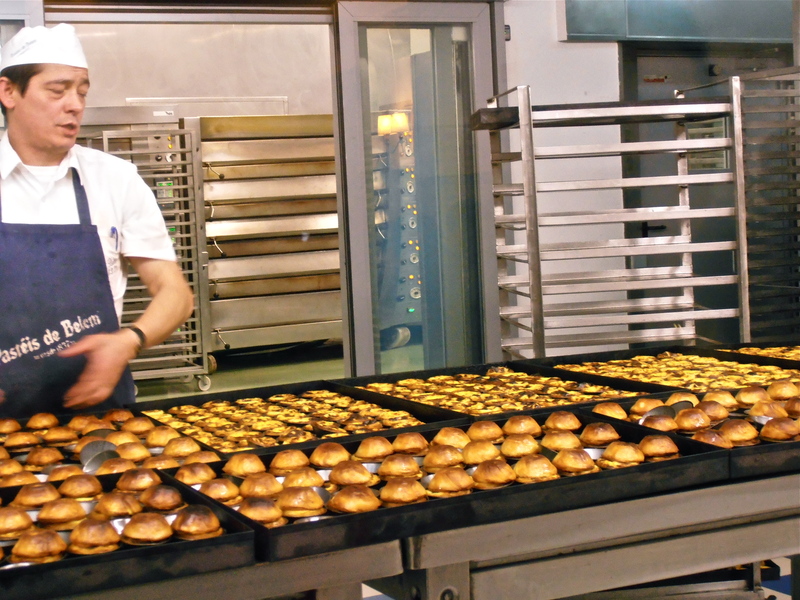 By contrast, what comes out of the kitchen is not just in excellent taste, but nothing short of divine! This entry was posted in Food Follies and tagged Food culture, Restaurants, Spanish customs on December 29, 2013 by ladyofthecakes. 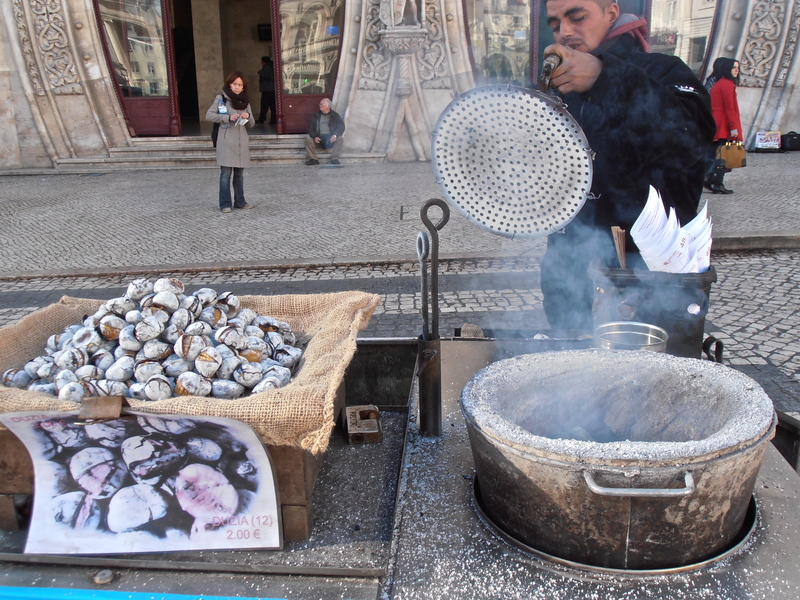 The smoke emanates from these little stalls selling deliciously succulent roast chestnuts. They are a common sight all over Europe at this time of the year, of course, but I’d never seen them being roasted in metal buckets before, from which the glistening brown morsels emerge all white, dusted with a fine covering of ash. Maybe this bucket-roasting technique is the reason why they are not in the least bit dry and so easy to peel. There are legions of these foot-high midgets, perched on their little pedestals, strategically positioned all around town. The kiosks are just as ubiquitous as the fire hydrants, and fulfill a related purpose 😉 I took this pic on Christmas Day, which is why this little pink refill-station is closed. ...and, you’ll have been waiting for this… THE FAMOUS TRAM! 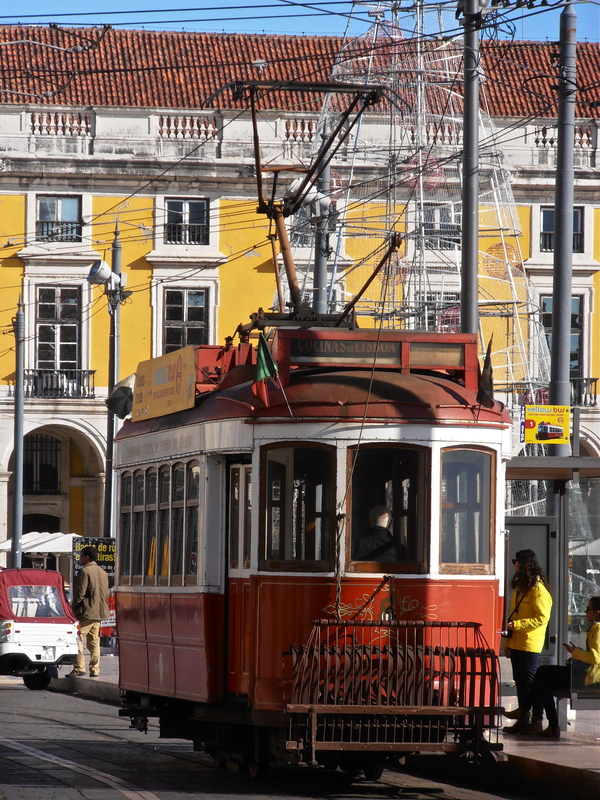 There will be more Lisbon Tram pictures, once I’ve had the chance to go through them all. This entry was posted in Lisboa and tagged Cafés, Lisbon, Portugal on December 28, 2013 by ladyofthecakes. Although this is southern Europe, these latitudes aren’t exactly blessed with a profusion of flowers at this time of year. However, that makes makes it even more delightful when you do spot an explosion of spring colours somewhere. 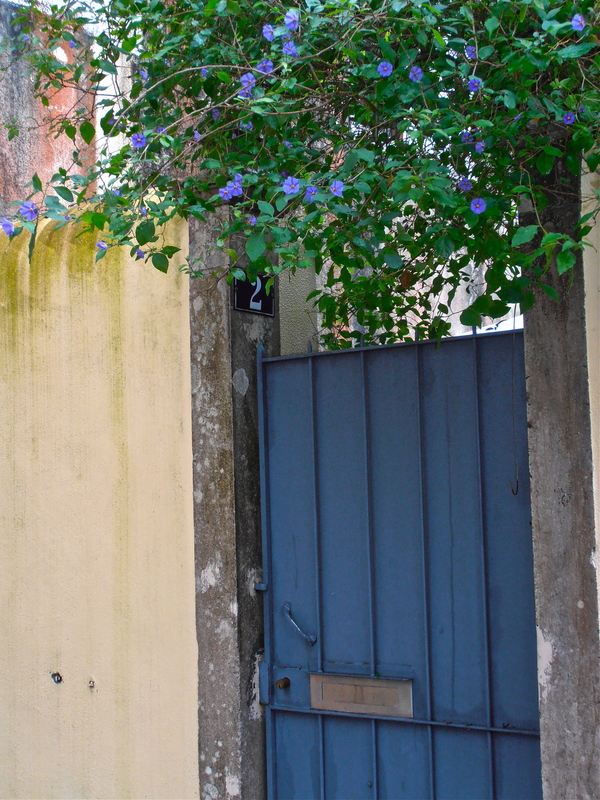 This last one wasn’t taken in Lisbon, but in Sintra. 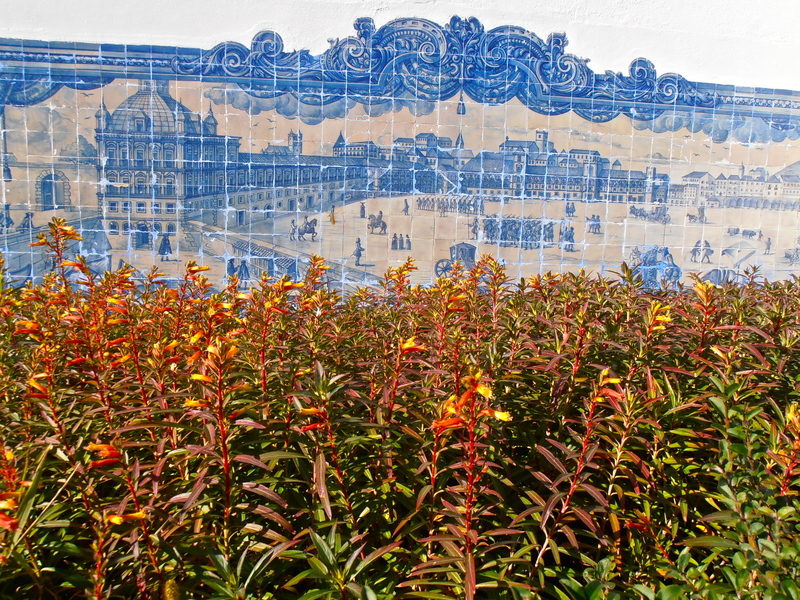 This entry was posted in Lisboa, Portugal and tagged Flowers, Lisbon, Sintra on December 27, 2013 by ladyofthecakes. 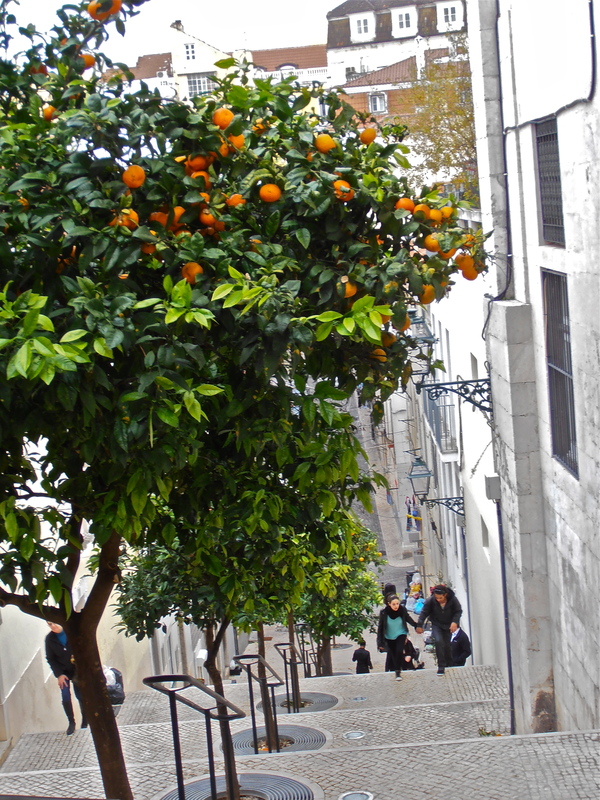 This entry was posted in Lisboa and tagged Lisbon, Portugal on December 26, 2013 by ladyofthecakes. 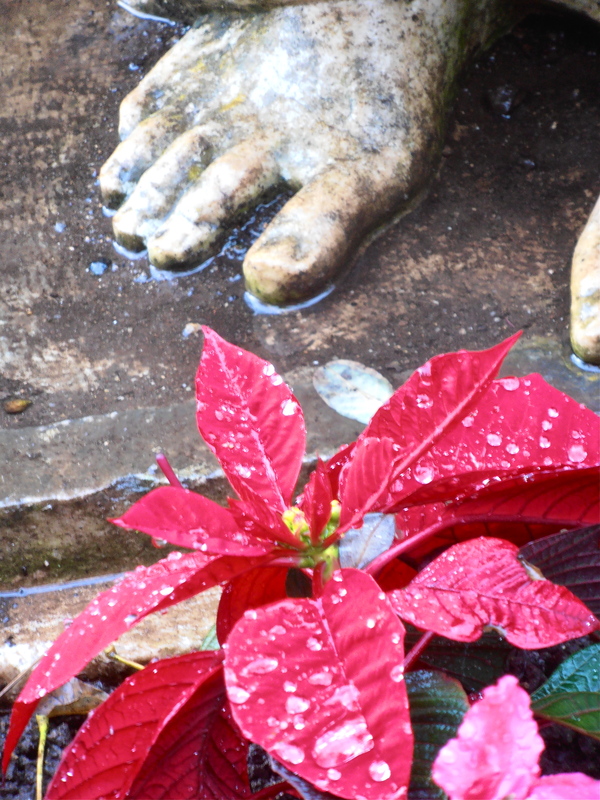 Poinsettia at the foot (literally!) of a statue. 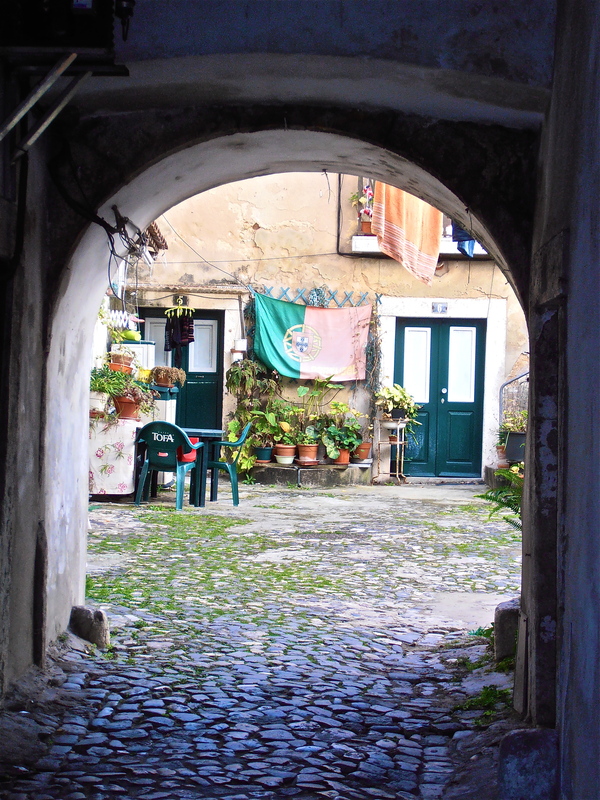 Taken yesterday in Sintra, an historic town about 20 miles west of Lisbon. 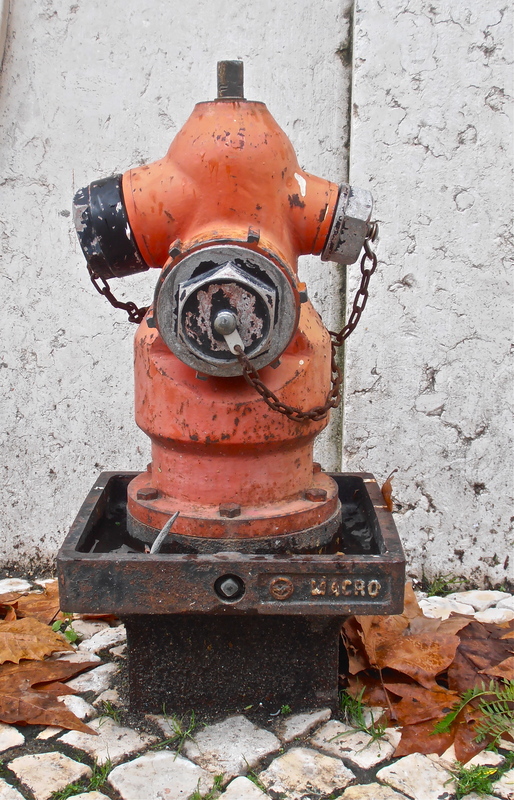 And yes, it’s raining, raining, raining…. 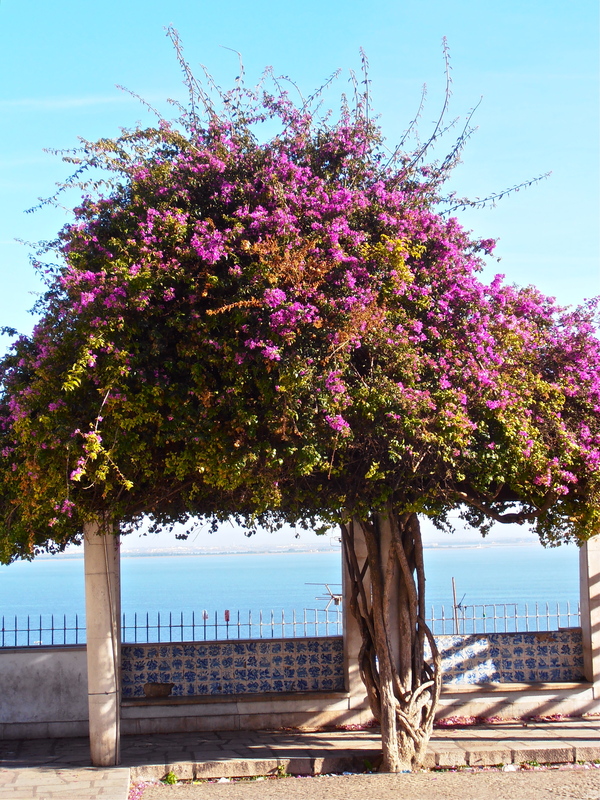 This entry was posted in Flowers, Sunsets & Sundries, Portugal and tagged Flowers, Portugal, Sintra on December 24, 2013 by ladyofthecakes. 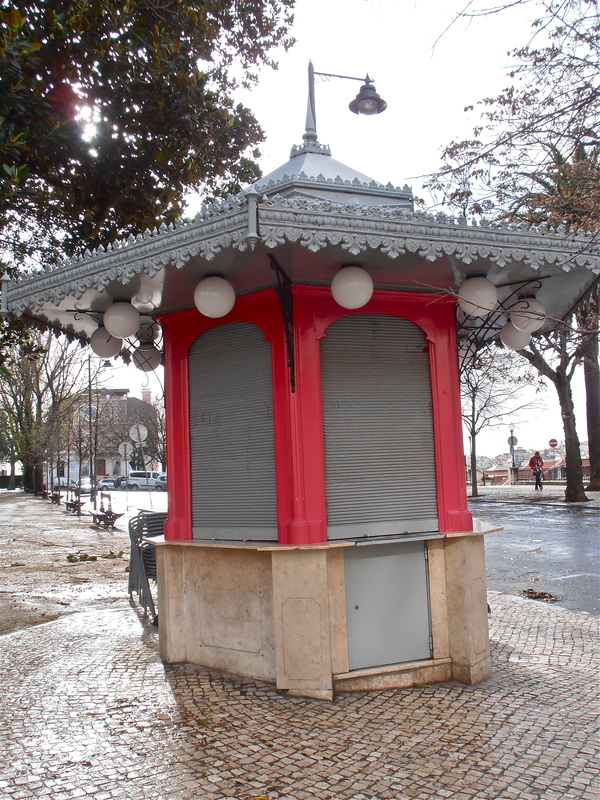 This entry was posted in Lisboa and tagged Lisbon, Portugal on December 23, 2013 by ladyofthecakes.